For the Tampa Bay Lightning, the 2018-19 season offers a clean slate for the franchise to recenter and focus solely on capturing the greatest trophy of them all, Lord Stanley’s Cup. After making it to Game 7 of the Eastern Conference Final in two of the past three seasons and sniffing the Stanley Cup in 2015, the time is now for the Tampa Bay Lightning. The days of paying lip service to their role as preseason favorites are over. It’s time to take action, putting to rest any chatter that they are the new Washington Capitals: an uber-talented team that struggles when it counts most in the playoffs. This season could be pivotal for the future of the Lightning. It shouldn’t be a question of whether or not they make the postseason this year, but instead how deep they go. Reaching the Conference Finals won’t satisfy this team or fanbase anymore. From upper management to coaches to players and even the fans, failing to win the Stanley Cup this year would be a crushing blow to a franchise that’s supposed to be one of the models of excellence in the league. 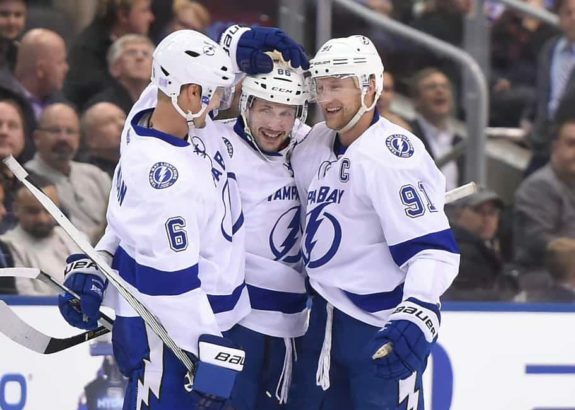 If for some reason the Lightning are unable to qualify for the playoffs, though, expect sweeping changes that could see anyone not named Steven Stamkos, Nikita Kucherov or Victor Hedman jettisoned from the franchise. Even head coach Jon Cooper, who has seen nothing but success since joining the franchise in 2013, would be a likely casualty if they underperform. So, even though they may one of the favorites coming into the season, the franchise has a lot to lose this year as well, making this season one worth watching. On paper, the Lightning should blow their competition away. They have an incredibly deep stable of forwards that will have no trouble powering the team throughout the regular season, along with a highly improved defensive corps that has the perfect balance of youth and experience. While winning the Atlantic Division in back-to-back seasons won’t be easy, there is more than enough talent to pull off this feat. Yet, with the drama surrounding the franchise at the start of training camp in the form of Jake Dotchin and Steve Yzerman stepping down as general manager, there’s no telling how focused this team will be once the games actually count. 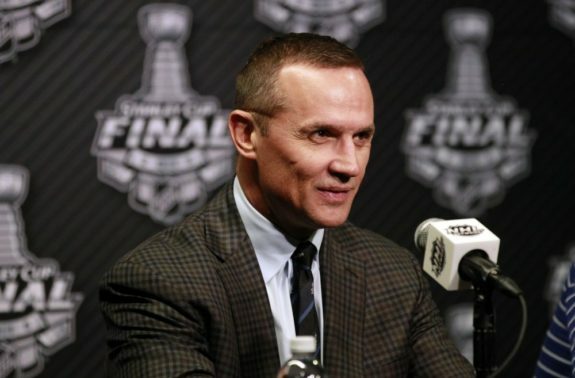 It’s difficult to know how heavy Yzerman’s announcement will weigh on players who recently signed long-term deals to stay with the team. In theory, it shouldn’t cause an issue, but hockey is a weird sport sometimes, where even small distractions can throw a star player off course for an entire season. – Can the Lightning block out the drama that’s plagued these early training camp days and focus on improving and getting better? 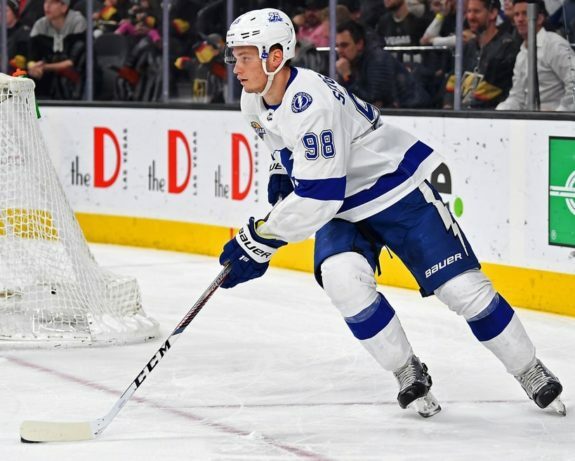 – Can Mikhail Sergachev and Yanni Gourde take the next step after enjoying phenomenal rookie seasons? – Can the Lightning avoid long-term, serious injuries to key players? – Will the team play complete games, or will they fall back into the habit of taking periods off while they have a lead? With the shocking news of Yzerman stepping down from his role as General Manager (GM), the Lightning will be experiencing turnover in the front office for the first time since 2010. The team remains in good hands though, as former assistant GM Julien BriseBois takes the reins of a franchise that’s already well built for the future. However, there have been major changes that took place behind the bench this offseason. 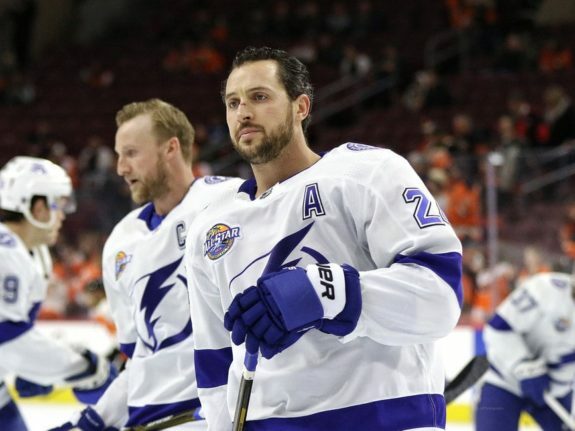 Outside of head coach Jon Cooper, there are a multitude of new faces in the coaching staff after the disappointing end to the 2018 playoffs. This offseason, the Lightning parted ways with assistants Rick Bowness and Brad Lauer, two veteran coaches who were part of the team’s rise to relevance over the last six season. Change is sometimes necessary, though, even this team hasn’t seen much in a few years time. The hope is that new coaches Jeff Halpern and Derek Lalonde will bring a fresh look and new ideas to a franchise that had become a bit stale in recent years, especially on defense. It seems unlikely for the Lightning to mix up their starting lines too much from how they ended last season. Their top-nine forwards were, for the most part, dominant throughout the year, and barring injury, should stay the same to start the season. Callahan is expected to miss at least the first month of the season since he’s recovering from offseason shoulder surgery, but his spot on the roster can easily be filled by Conacher or Martel until he is healthy. 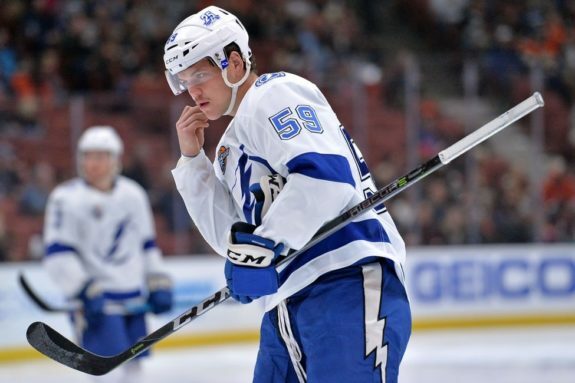 Right now, there are two forwards worth watching in the Lightning’s AHL affiliate the Syracuse Crunch. Both Mathieu Joseph and Alexander Volkov had fantastic rookie seasons last year for the Crunch, and they are primed to make a strong case for NHL ice-time sooner rather than later. While it’s likely they both start the year in the AHL, it wouldn’t be surprising to see both players with the Lightning by the end of the season. Heading into the 2018-19 season, the Lightning will be sporting one of their most talented all-around defensive corps in franchise history. It starts at the top with the 2018 Norris award-winning Hedman, who will be looking to build upon his incredible 2017-18 campaign that cemented his place as one of the top defenders in the NHL. Behind Hedman, though, things get a little bit tricky. With McDonagh playing the majority of his time on the left side of the Lightning’s second pairing, the team will need to decide whether they should move Sergachev to the third-line or shift him to the right side so he can play on the second-line. If he can make that shift and continue to play at the same level as his rookie season, the Lightning could have one of the best defenses in all of the NHL. If Sergachev is unable to make this shift, though, the unit becomes a bit muddled, forcing Girardi to play bigger minutes than he should be taking on at this point of his career. There’s still potential for success even if this outcome occurs, but it is far from an ideal for the team. Also, it is worth noting that the defensive structure should have a bit of a different look this year with the departure of Bowness. It is difficult to know exactly what this will effect during an actual game, but the team was in a clear need for change after they were largely manhandled by the Capitals throughout the Eastern Conference final. There’s little doubt about the Lightning’s goaltending hierarchy heading into the 2018-19 season. 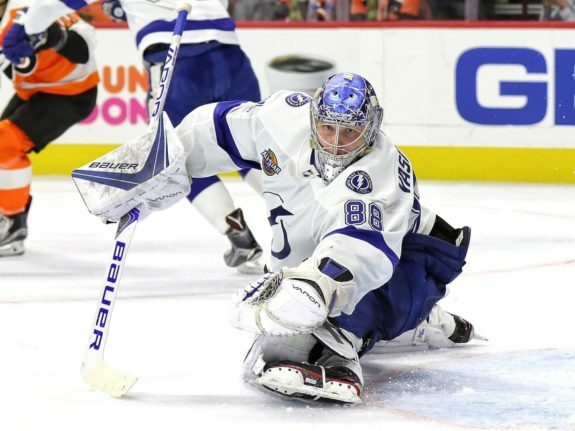 Andrei Vasilevskiy is the clear number one starter, and he should expect to get 55 to 60 starts throughout the year as long as he stays healthy. Behind Vasilevskiy is Louis Domingue, who wrestled the role of backup goaltender from Petr Budaj last season. 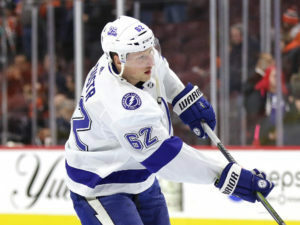 If he can continue with the excellent play that made him the clear choice to take over this role, then the Lightning will be able to lean on him a little more than their previous back-ups, giving their starter a few more days off than in the past. Should an injury occur with one of their to goaltenders, the team has two options in Syracuse who are on opposite sides of the experience spectrum. First, there is AHL veteran Edward Pasquale, who was fantastic for the Crunch in 15 appearances last season. Next to him is Connor Ingrahm, who is a young goaltending prospect coming off his first year of professional hockey. While neither player is ideal for the Lightning, they could provide a competent NHL start or two in case of an emergency. It’s not easy being a favorite, but the Lightning have the experience and drive to keep from buckling under the pressure this season. With some fantastic competition coming from the Atlantic division, though, (any one of the Toronto Maple Leafs, Boston Bruins or Florida Panthers could make a strong case to win the division this season) the Bolts will not be able to coast into the playoffs. They will have to play their best hockey each and every night to even qualify for the post-season this year. As long as they stay relatively healthy, they should be able to fight through this gauntlet and earn one of the top spots in the East. Even if they don’t win the division or the President’s trophy, they will still be one of the teams to beat next April. Everything is in place for them to reach their ultimate goal of a Stanley Cup, they just have to have the perfect mix of drive, talent and luck to make it there. No matter what, this will be a fun season to watch.